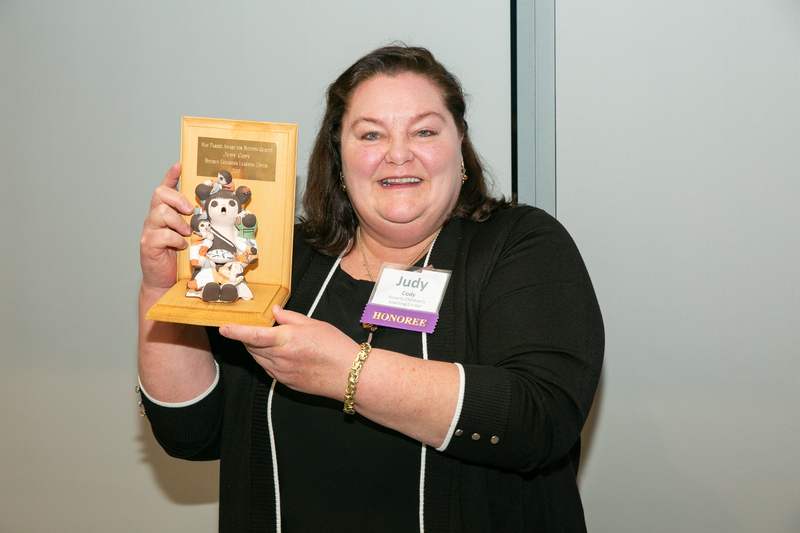 The Children’s Investment Fund, an affiliate of the Community Economic Development Assistance Corporation (CEDAC), presented Judy Cody, executive director of Beverly Children’s Learning Center (BCLC), with the Mav Pardee Award for Building Quality at CEDAC’s 40th anniversary celebration held on March 14 at the Massachusetts Institute of Technology (MIT). The award recognizes organizations or individuals working to address the need for physical environments that support high-quality early education. Cody oversaw BCLC’s expansion to a new 16,000-square-foot facility that provides safe and affordable early education and care for nearly 250 children each year on the North Shore. At the same event, former State Rep. Mel King was honored. King, a legendary community organizer, crafted the state legislation that created CEDAC in 1978. CEDAC is a community development financial institution that provides early stage financing and technical assistance to community-based and other non-profit organizations engaged in effective community development in Massachusetts. In 2015, Cody led the first-ever capital campaign for Beverly Children’s Learning Center, raising over $2 million for a new state-of-the-art early education and childcare center in Beverly. The campaign included $1 million grant funding from the Early Education and Out of School Time (EEOST) Capital Fund. EEOST is administered by the Department of Early Education and Care in coordination with CEDAC and the Children’s Investment Fund. Founded in 1973, BCLC has served over 10,000 children and families in the Beverly area. Their new space has allowed them to dramatically improve their programs and services, providing individual environments conducive to high quality care, learning and security while allowing opportunities for intentional interaction among the different age groups they serve (newborn through early teen). To maximize the impact of their new space, BCLC, under Cody’s leadership, will complete this spring the second phase of improvements with a new 25,000-square-foot natural outdoor learning play scape. The play scape includes a large array of natural interactive features designed to encourage more physical activity and creative play, including sensory gardens, mud kitchens, climbing hills and water stations. BCLC will host a ribbon cutting for the play scape from 9:30 to 10:30 a.m. on Thursday, May 16. For more information, visit www.bclckids.org or email info@bclckids.org.